Currently viewing the category: "Logging"
In recent years it has become fashionable for conservationists to substitute and promote other land classification in place of wilderness designation. Wilderness is “passé” so we are told, even though it is the “gold standard” for land protection. The Deschutes National Forest with the blessings of the Deschutes Collaborative is busy cutting and degrading our forest ecosystems based on several flawed premises. 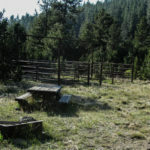 The recent guest commentary by Joe Prinkki and Joe Skinner, members of the Custer-Gallatin Working Group, supporting the logging of Bridger Canyon was full of misleading and scientifically inaccurate common myths about forest health and wildfire. The proposed North Bridger “forest health” project on the Gallatin National Forest north of Bozeman, Montana near the already heavily logged area by Bridger Bowl is based on numerous false assumptions. The proposal displays the Forest Service’s Industrial Forestry bias and its subterfuge of science. “What but the wolf’s tooth whittled so fine the fleet limbs of the antelope?” wrote the poet Robinson Jeffers. Tree fire scars are used to reconstruct past fire occurrence. These historical reconstructions are often used to guide current forest management on federal lands. I recently attended a presentation on invasive weeds by a representative of the Deschutes National Forest. The problem with the presentation was that it promoted and legitimized an industrial paradigm to weed threats. The Forest Service (FS) promotes an Industrial Forestry Paradigm that treats the symptoms, not the causes of ecological degradation.